This sign is located at N41 51.620 W80 57.168. Inspired by the amusement rides they saw at other parks and learned about by attending the annual convention of the National Association of Amusement Parks, Pools and Beaches, E.M. “Pop” and Martha Pera began making plans for an amusement park at Geneva-on-the-Lake in the 1930s. Their first step was to build a Dodgem structure next to the Pier Ballroom. American involvement in World War II started just about the time the building was completed, fall 1941, and the amusement park was put on hold because metal was being diverted into war-time purposes. The Peras used the building for carnival games and painted it in a patriotic theme. 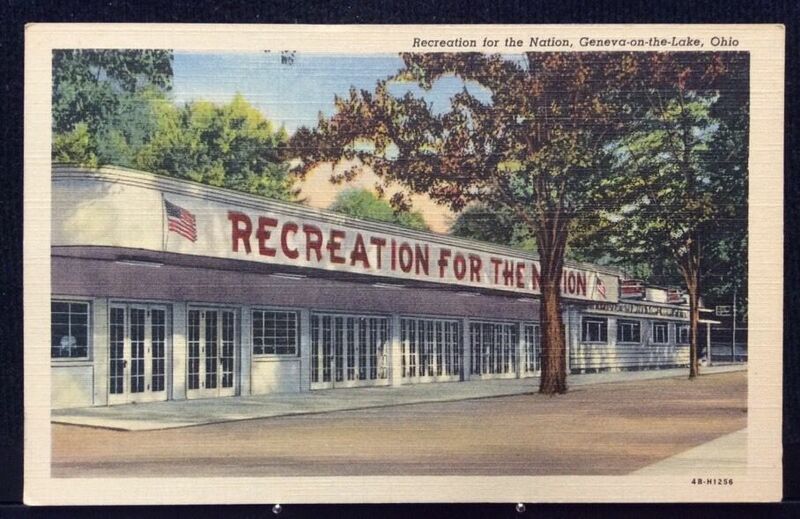 “Recreation for the Nation” was emblazoned on it. It would be the only period when carnival games existed in the park. A new set of bumper cars from Dodgem Corporation of Massachusetts arrived in the spring of 1945. Electrical service was run from the ballroom to the Dodgem building and the Peras were in the amusement park business. There was just one issue: Every time the Dodgem cars powered up, the lights in the ballroom dimmed! A Flying Scooter ride was the next purchase. Pop Pera called them The Flying Jets to take advantage of the postwar excitement of jet planes. The Peras noted the baby boom that came after the war and they renamed it Kiddieland in 1955. But even before taking that marketing move, the Peras had been banking on the growth of family vacations at the lake. In 1948 they added more Allen Hershell kiddy rides, including a wet-boat ride, pony cart, Skyfighter and a three-abreast merry-go-round in 1957. 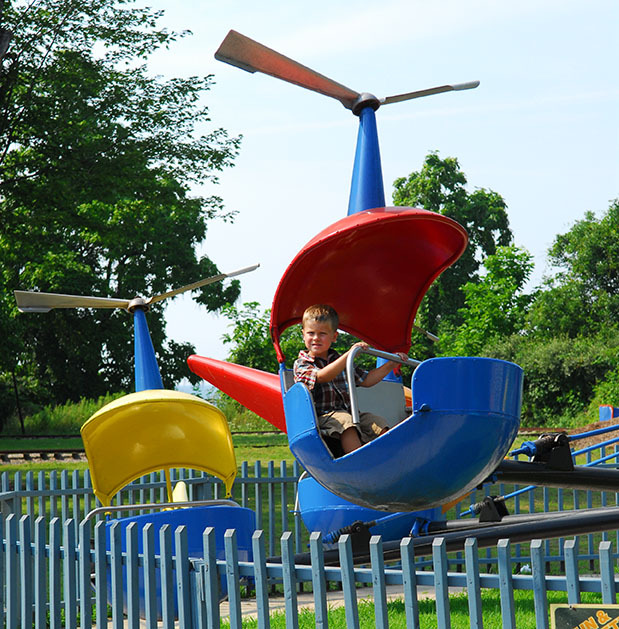 An Allen Hershell helicopter ride was purchased in the 1960s; it was the last ride from that company to be added to Kiddieland. During the 1970s, operation of the park passed to Martha Woodward, the Pera’s only child, and her so-in-law, Don Woodward Sr., and his son, Don Woodward Jr. 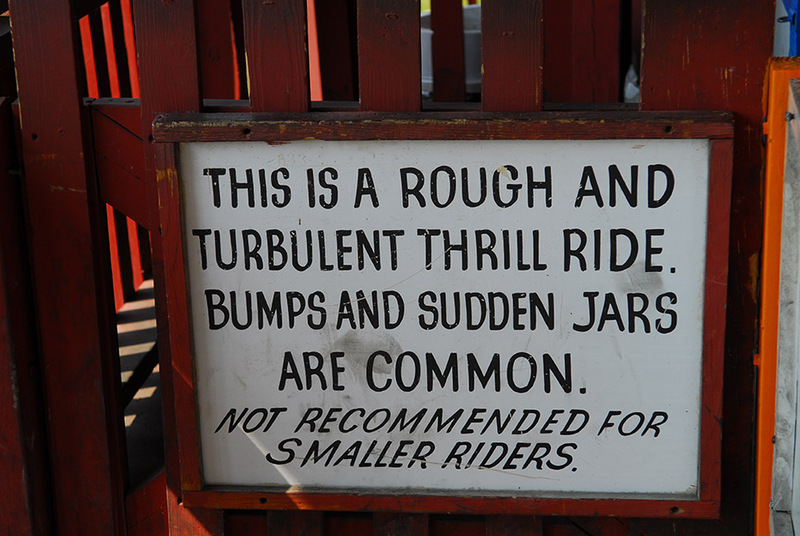 Adult rides came in the late 1970s: Tilt A Whirl, Paratrooper and Roll o Plane. A rare Allen Hershell-William Tracey Dark Ride replace an aging Pretzel Dark Ride. The ride was one of only three manufactured by Allen Hershell and was the last in existence. It came from the closed Westview Park, near Pittsburgh. 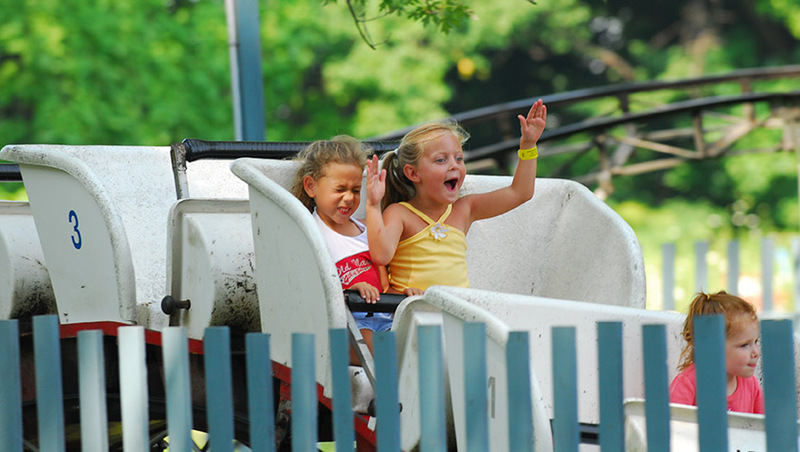 In 1980 Kiddieland was renamed “Erieview Park to appeal to a new demographic, the teenagers. The park eventually began to lose money and after several years of losses, the decision was made to close it at the end of the 2006 season and hold an auction. (Erieview) makes its own sort of music. This amusement park came to life each summer. The merry go round, flying kites, helicopters, cruise boats, Ferris wheel, dodge ‘ums’ (bumper cars), and fun house were all here when I was a young boy. On summer Sunday afternoons, mom, dad, and Meme (my French grandmother) would treat us to a visit to Times Square and Pop Pera’s amusement park. I remember scoops of homemade ice-cream heaped onto a sturdy sugar cone, cotton candy fingers, and the intoxicating music of the merry-go-round, as well as the steady beep-beep-beep of the flying jet machine guns. I remember the “can’t wait” anticipation on Saturday night knowing that my brother and I would be going to “the center” on Sunday. I learned a few things from this place. I learned that experiences in places such as this are important to pass on to your own children. Fortunately, I was able to ride the flying kites with my own children. We screamed together as the Ferris wheel was stopped at its highest point to let off customers. We pretended to be frighten by the mini roller coaster. It is important for your own children to meet and come to know the people who were part of our lives when we were young. I learned that it is important for my children to come to experience the sights, sounds, and aromas of this place. These experiences are gifts we give them, for soon we will be the ancestors and they the story tellers.